The endless locked doors and wobbly picture frames. Irascible locks on every surface refusing to chime brightly and divulge their secrets. A horde of evil pandas. These will be the denizens of my nightmares someday, the hazards of the JIG escape game studio, as each week I recline in my yellow rocking chair, thick black glasses, and cigar stuck out of the side of my mouth, pre-screening the Weekday Escape hopefuls. It hasn't reached that point yet. Someday, though. Someday. Until then, I can only dream of elevating my escape game nerdiness to such levels of coolness. You can say you knew me when. And how, here's this week's feature: go ahead, stay up late; it could be worth it. Find the Escape-Men 98: Horse Racing - No1Game's latest 10 hidden green guys games—with its multiple areas to search, two endings, and slightly more complex puzzle construction—falls short of its own spotlight because of a few tiny but enjoyment-stifling missteps in the pacing. It's like when you're watching a pretty good movie and know it could just be better if only they let you step in as director for the day to make a few edits and cuts. As consolation, it gets top billing in this week's WE line-up and is touts approved. Candy Rooms No.8: Azure Pop - from FunkyLand may be more fanfare than actual substance; but, who cares? The hip décor and bright colors inspire happy thoughts and tapping toes. No time to feel let down that there aren't more things to do in this way cool room, just set your sights on finding the 5 candies and enjoy it while it lasts. Besides, if we were ranking the series, this entry lands on the more complex end of the scale: fun clue presentation and not quite obvious answers give it the thumbs up. Chicks Hide and Seek 17 - Rounding out our trio comes Yuri with another hide-and-seek-centered escape. It could be subtitled "Adorableness in Space". Eschewing gravity and glumness, this plucky brood of darling chicks employ camouflage, locks and clever item usage to conceal themselves from your gaze. While not exactly easy, it's less a brain teaser and more a round of peekaboo with your cheeky baby nephew, all the entertainment here is in the cuteness. Got to chuckle as I wonder, though, how those baby chicks get themselves into the places they do. We love escape games, and our readers love talking about them and sharing hints! How about you? Let us know what you think, ask for clues, or help out other players with your walkthroughs in the comments below. Weekday Escape N°21 Walkthrough now available! Main screen: Click on the left man on "Toilet". Entrance: Click a bit to the left of the bottom of the leftmost pillar, and get the paper. Back out once, and give it to the green man to the right. Click on him. Use your wallet on the shop in "Entrance", and give the ice-cream to the green man in "Field". Go to "Entrance" again, and buy another ice-cream. Give it to the man in "Field", back out, and click on "Field" again. Click on the green man to get him. Zoom in on "Paddock", and get the man standing in the middle, having a little different color. Go to "Passage", and turn left. Use the man on the spot on the floor. Turn right, and then turn left again. Wait until the cutscene ends, and click on the window. Click on the green man. Choose the left path in "Passage", and open the left part of the grey cabinet. Get the binoculars, and use them on the blinking spot in "Field". Click on the green man to get him. Choose the right path in "Passage". Click on the left horse, and then on the tail. Click on the green man to get him. Choose the left path in "Passage". Click on the bottom right of the white pillar, and get the "Pocket tissue". Click on it to get a "Paper string". Back out twice, take the right path, and click on the rightmost horse.Use the "Paper string" on the nose of the horse a few times, and then click on the green man to get him. Paddock: There is a green man in the background. Click him. 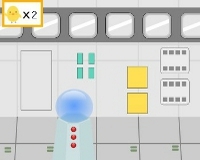 - 1 rectangle in the main view of "Passage"
- 2 trapezoids in the main view of "Passage"
- 3 circles on the rice poster, when turning left from the main view of "Passage"
- 4 stars in the main view of "Entrance"
Zoom in on the remote, and type the code "Rectangle, Trapezoid, Circle, Star" in. Push OK. Click on the green man to get him. Not betting on NO.7 and NO.4. Betting on NO.7 and NO.4. There is a chick in a apace suit floating outside! There is a circle and triangles whatsit next to the green square on the left. Let's call this the six sided hatch. When you're done with all of that (whew!) go left. It's probably a perspective view of a long hallway, but let's call it a ramp up to a big door instead. What can we find here? Take a closer look at the big door. Did you see the chick? Hiding on the lower right. chirp! Now, let's see what these yellow rectangles are all about. They're probably fancy space lights. Focus your attention on the green dots on the left. See anything interesting? There's a chick hiding in the top light! chirp! …that one of those big gray panels opens up. Want to see a neat space orb? Go left. This place is filled with interesting things to explore. There's something interesting about those yellow squares. There's something interesting about -- hey there's a chick inside that orb! Can you get him out? There is a vertically oriented rectangle button and three round buttons vertically arranged on the orb stand. You probably need to press the round ones in some order and then press the rectangle one. …arrow X3. Probably. Remember that from the ramp? Try pushing the round buttons bottom to top. Now try it 3 times before pushing the rectangle. chirp! When you get the chick out, you also find a suction cup. Interesting. Those are some interesting windows up there. Hey, another chick is trapped! It's a good thing that these windows are made of a clean, smooth material. Like how what a suction might require for it to work properly. Put the suction cup you got from the base of the orb on the window and pullet. chirp! While we're up here, might as well explore to the right. Those windows are up to their old tricks again. Get the screwdriver. Okay, that's enough sightseeing. Time to get serious. Go left and you're back at the control room. You've got to save the chick behind the blue panel. So what's up with the whatsit on the left next to the green square? Probably some kind of controls. But, what does it control and how is it used? Can that arrow have anything to do with it? Some kind of cryptic spaceman instructions? The arrow isn't much help, but the triangles do go in different directions. What else in this space ship goes in different directions? Did you notice how the windows trapping the chick and the screwdriver behaved? Over there above the orb. There's more than one window. Try opening all of them. that big arrow under the controls. down-left-right-up-right-down. Then press the circle. That did it! A space arm grabbed the chick outside the big window. But where did it take him? By now, you should have saved seven total chicks. Brave space explorers, all. But, there are ten to find, so let's keep going. Time for some free form exploration. Go look around all the places you've been. And, check out all the areas you just ignored because they didn't seem important or logical. Did you find the hidden, secret Star Wars room? You can find it near the six sided hatch. Neither of these chicks is your father, but one of them is in a space suit. The arm brought him inside! And what an interesting gem that is! chirp! The other chick is still not your father and doesn't even want to look at you. The view out the window is much better. And, hiding in the glare of the sun is pretty sneaky. chirp! Nine chicks and counting. But what was the gem all about? Remember seeing anything with six sides? Use the gem to open the six sided hatch. Don't be afraid little one. All of your friends are here. chirp! chirp! Chick army assemble! Let's get out of this crazy space ship! Open the big door and go outside. YOU WIN! Click on the brave chicks to make them float around, just for fun. Zoom in on the couch, and lift the middle pillow. Click on the round candy to get it. Click on the right part of the screen, and zoom in on the box in the middle. Click on the big button a few times, and note which character is changing on which dot. Back out twice. Zoom in on the door, and then on the box in the middle of the blue net to the right of the door, and input the code from the box earlier. Push Ok, open the box, and get the handle. Back out twice. Zoom in on the couch, and then on the table to the left of it. Use the handle on the jar, open it, and click on the little lollipop to get it. If the first character changes at the third dot, the first number is 3. Click on the door, and on the rectangular candy in the upper right compartment of the blue net to the right of the door. Zoom in on the right part of the screen, and then on the globe. Get the frog disc, and back out twice. Zoom in on the left part of the screen, and then on the cabinet to the left. Put the frog disc in the holder, and get the dice. Back out once. 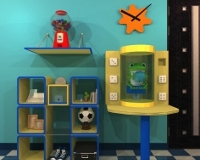 Zoom in on the compartment with the frog, and put the dice in the empty space. Turn the frog as the dices say, and get the coin. Back out once. Zoom in on the chewing gum dispenser in the upper left, and put the coin in it. Turn the handle, and get the chewing gum. First, turn the frog to the 1-dice, then to the 2-dice, and so on. The code is "Right, Left, Left, Right, Left, Right"
Click on the middle of the screen, and on the table to the left of the couch. Click on the big lollipop in the wase to get it. - but nothing appears to happen. Oh, for [expletive deleted]'s sake, power of post. That arrow is a bit of a clue as to what direction I should be taking my directions from. I used the arrow and the windows but I don't see where the chick goes after the arm grabs it. I'm stuck on 7 chicks.
. I am so stuck. How did I double post? I only clicked once. *confused* It's too bad that the update didn't allow us to delete our comments. But, if you're talking about the six sided hatch sort of thing, I can't get that open either. I am stuck at nine chicks. I one chick from space, one behind the screwed panel, one at the door in the floor, one behind the panel in the wall above the door in the floor, one in the gumball(?) machine, one from the top yellow strip on the wall to the right of the gumball machine, one behind a glass panel, and two from the yellow strips on the floor to the exit door. The chicks in this game are so cute though! All those chicks trying to hide in front of the color yellow. Adorable! Do you guys think that posting a walkthrough stifles conversation? I like it better when there's lots of people trying to solve the puzzles together, but I feel like I killed the conversation on the Biyori game with my walkthrough and now I'm wondering if the two walkthroughs here have killed the conversation about the green men and the chicks. What's a good amount of time to wait before posting a walkthrough? In my experience, it does tend to stop the conversation when a walkthrough is posted. But, walkthroughs are helpful and appreciated. So, it's hard to say which way is better. I like to see a lot of discussion in the weekday escape, yet not everyone who reads this article wants to comment... It's really up to you guys yo decide what you prefer. Hmm. As for conversation: does anyone know the San Francisco Bay Area television host (a popular program from the 70s/80s) alluded to in my intro? I love walkthroughs ... when I get stuck, I'll read the conversations first to see if anyone has posted a clue. But for some point-and-clicks, I won't even attempt them until a walkthrough has been posted! Back in my 20's and 30's I took pleasure in figuring out things on my own, but now, after a half hour, I'm *done. * Who has time??? Yeah. I just don't know how people get through some of those pixel hunt games. Oh, I clicked in that obvious spot a billion times but you're telling me I didn't click in the exact right corner of that spot? Sheesh. It does seem to stifle the conversation, but only because most of it is about beating the game. Rather, I think we should work around that and focus on more holistic conversations about the games. Think of how much is ignored just because people are so focused on getting to the end, rather than enjoying the game itself. Make sure you are standing in the "Paddock" scene when pressing the OK button. I had to resort to the walk through. number 4: I have the actor / teacher guy but I cannot see the "spot" on the floor on which to use him. The "spot" is in the right part of the floor, and make sure that you turn left. From the "Passage" main screen, you can turn left or take the left or right passage. @Paul: I have a challenge for you. I want you to go play one of the candy rooms which have not been featured on JIG (#2 or #3), and write a walkthrough for it. I'll give you one hint for each room. The only not-so-intuitive part of this room is the panel that looks like an iPhone. The way to use it is to press and hold the button until a clue appears. The only hard part of this one is the 4-digit code, for which the clue is the table with the cards in it. The "K> >M" part refers to the alphabet, namely: what letter comes between K and M? Apply that letter to the cards to get your code. Thanks! I totally missed that scene. When I was a kid I heard a comedian to a horse race skit. Rubber band shoots to the lead. Bubble Gum is sticking to the rail. Black Ink is running all over the place. and it's Cabbage winning by a head. You are looking for a spotlight to put the singer in so he can perform. There's a poster somewhere nearby and, also, be careful of the traffic! P.S. there are two ways you can turn left when you first enter the passage. Instead of entering the room on the left, just turn to the far left wall. If you're in a room, you're in the wrong place - you went left instead of turning left. Go back out of the room, and try clicking further to the left this time.